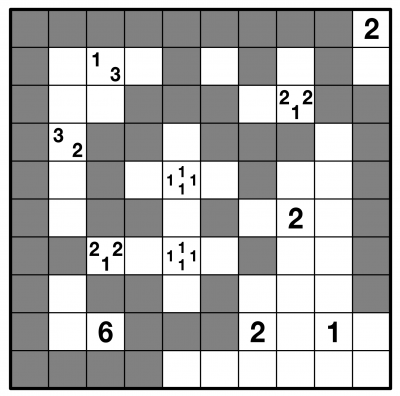 Tapa is a surprisingly deep logic puzzle, solved by shading selected squares while obeying the clues. 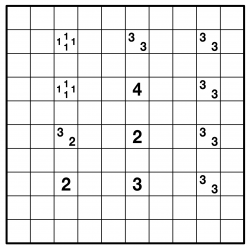 Some squares in the grid contain numbers, revealing how many of the surrounding eight squares are shaded. If there are multiple numbers in a square, then these are the lengths of each untouching set of surrounding shaded squares. It might sound complex but a quick look at the example solution shows how it works. 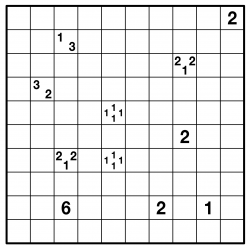 Shaded squares must all form one single region, so you can travel from one shaded square to any other just by moving from square to neighbouring square. You also can't have any 2x2 (or larger) areas of shaded squares, and you can't shade any clue squares. A huge number of Tapa variants have been invented, but the original puzzle remains the best. They can be made at almost any size or difficulty.